Finding an image to suit this challenge has taken me all week and I’m still not sure I’ve really captured refraction but at least it’s given me the chance to share one more photo from Lake Crescent, WA. This crystal clear water is due to a lack of nitrogen which inhibits the growth of algae allowing natural light to reach depths we’re not used to seeing in local lakes. I liked the rippled effect of sunlight on the rocky lake floor and am posting today as part of the Weekly Photo Challenge: Refraction. Thanks, Nancy. You would love this place. This is absolutely beautiful. I want to go there. It’s about 30 minutes north of Forks if you have the opportunity for a short road trip, Ruth. I’d love to be there right now too. Thanks, every direction I turned was a photo op here. I think you did very well with the challenge Lisa. I love the clear water. I hope it remains that way forever. Is there a second photo? If there is, I can’t open it. But the first one is perfect. I am spellbound by the beauty in this photo! Holy cow, what a fantastic area of the country!! Everywhere we went in the Olympic National Park was filled with amazing views, I can’t wait to go back! Eric told me how he used to row out into the lake and see trees that came down in a landslide, preserved underwater. I want to go there! Next time I want to go out on the lake instead of viewing from the shore, D’Arcy. Eric’s description sounds wonderful. You nailed it. Its taken me all week, too, because I didn’t want to just post a rainbow. But now, I’m gonna give up and post a rainbow! Love this placid place you’ve shared with us. Thanks, Rusha. 🙂 I’ll come by to see your rainbow soon and hope the next challenge is a little easier! Postcard perfect. I always enjoy visiting your corner of the world. Believe it or not no one really knows, Andra. The only reason it’s official depth is listed at 624 feet is because this was the limit of the equipment used in the 1970’s when a group of college students set out to measure the distance to the bottom. Later, when the power company laid cables across the lake floor they reported depths of more than 1000 feet but again, this was the maximum depth their equipment could measure. 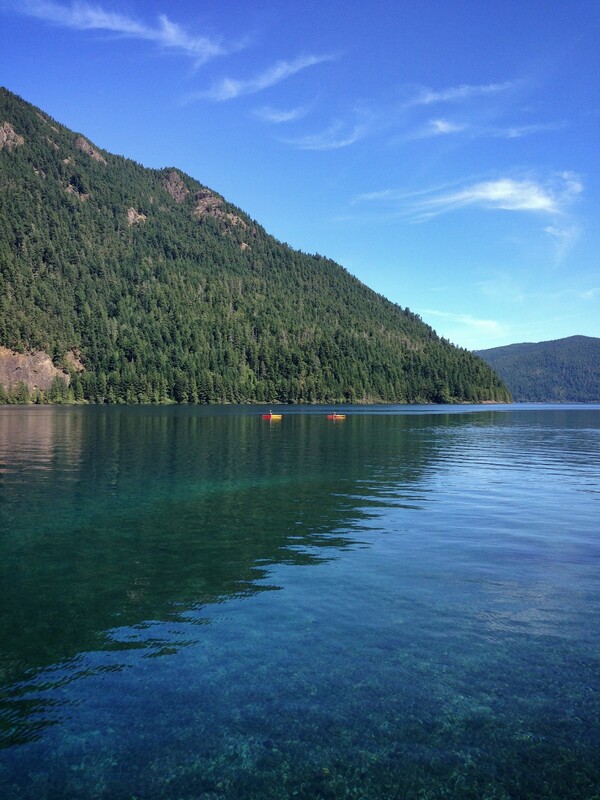 Lake Crescent is one of my favorite lakes in the world. The drive around it, surrounded by lake on one side and mountains and trees is simply a beautifully awesome drive. I agree completely, Ray this is an unforgettable lake and amazing drive. I can’t wait to go back and am really happy to hear you’ve enjoyed the same views. Beautiful lake. Mountains, deep clear water, what more could you want.